Our September 6-19 Alaska World Arts Festival (AWAF) in Homer, is the first annual festival of its kind in Alaska—an assembly of diverse artists exchanging passion, purpose, education, and culture through art. We connect people, ideas, and projects to foster understanding between art lovers around the world while growing our statewide visitor industry. We are seeking your support as a sponsor to advance our project, building on the shoulder season of commercial tourism and fostering relationships toward understanding diversity. ​Homer is renowned as a unique community and cultural center that has been attracting and inspiring world-class artists for over 50 years. We expect to attract 2000 visitors in 2019 including professional artists and fine arts lovers from Alaska, the lower 48, Argentina, Scotland, England, Australia, Uruguay, Spain, Germany, Ireland, Turkey, South Africa, Brazil, France, New Zealand, Greece, and Portugal. We anticipate AWAF becoming a statewide Alaskan tradition. 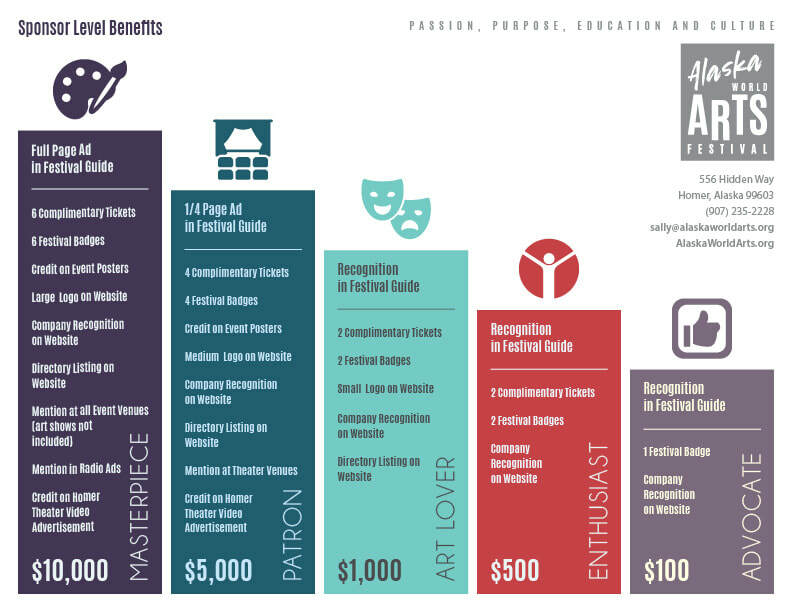 Partnering with AWAF is a purposeful way to support our statewide community, and develop a program designed to advance artistic endeavors and grow our economy. Your participation is vital to the success of this event, and I thank you in advance for your consideration. ​If you have any questions, please contact me. Thank you for taking a moment to complete the form below. Alaska World Arts is a 501(c)3 nonprofit organization. We respect the choice of individual sponsors who wish to remain anonymous. If you'd like to pay by check, please contact us for a mailing address.